The newest brewery located in Penticton BC might have the best location of any brewery in BC! Located two blocks from the beach on Okanagan Lake this brewery will be hosting many a thirsty local and tourist. Bad Tattoo Brewing will be serving great beer and amazing pizza to beach goers and craft beer fans both. I was lucky enough to find a spot at the bar on a Friday evening (not an easy task at all). There are 50 seats inside and 50 seats on the patio basically all full. Walking into the tasting room you will be met with a nice little tasting room with lots of seats and a bunch of staff. It will be very obvious from walking in that they make pizza as there is a good sized pizza oven located in the corner (I would venture a guess they will need a bigger one or a second one soon). A month into operation the brewery has four beer on offer including a Westcoast IPA, Los Muertos Cerveza Negra (Black Lager), ACP Golden Ale and the Full Sleeve Stout. For the non-alcohol drinker they also make a craft root beer to enjoy. Make sure to have a high quality thin crust pizza with your beer (I don’t even like thin crust pizza and I loved the Sriracha Chicken pizza! After enjoying the great beer and pizza I was lucky enough to get a tour of the brewery from one of the owners Martin. I was very impressed that this brand new brewery was built by the small ownership group in this amazing location just for the brewery. The brewery has a ton of space for expansion and the beer is being brewed as fast as possible. Currently most of the beer is being served at the tasting room as it is flying off the shelf but it will be served elsewhere in Penticton soon as well as being packaged in cans and bottles. If you are lucky you will also be finding their beer in casks as they have ordered a bunch of casks and the hardware needed to fill and distribute them. If you are heading through Penticton soon stop in for a 1L or 1.89L growler fill. So if you live in Penticton or close by or if you are just driving through on holidays make sure to stop in for a glass or 4 of beer and a pizza! You will not regret it and you might just find a new favorite place to hand out near the beach! 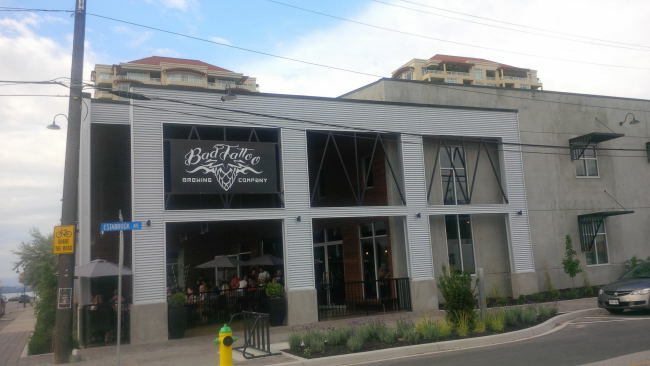 This entry was posted in Brewery and tagged bad tattoo brewing, bc, beer, brewery, canada, craft beer, okanagan lake, penticton, pizza, pizza oven, tasting room. This makes me want to visit Canada!!! Well then come to Canada!